IS THE KEY TO OUR CULTURE. Our mission is simple: Never be satisfied with what has already been achieved. This idea is the driving motivator of Angry Crab Shack. We continuously invest in our brand, processes, and products in order to improve every day. This is true for our Franchise Owners, Corporate Team, and Angry Crab Shack staff. 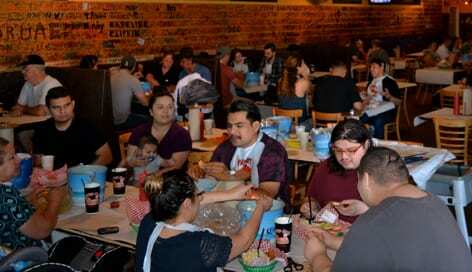 Our Angry Crab family extends to our guests but starts with our Franchise Owners and employees. We created this concept with the intent to grow our family, give opportunities to emerging entrepreneurs, and bring good cooking to even more places. Our affordable price point allows guests of all kinds to visit often, while our low operating costs keep franchise owners thriving. We have proven out our business model in Arizona, but our concept is universally appealing. To date, we have served tens of thousands of satisfied guests from all walks of life, and they keep coming back for more! Founder and King Crab, Ron Lou, is the mastermind behind our Asian Cajun concept. 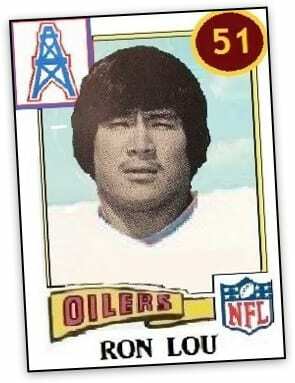 Former NFL player Ron Lou spent four years in the league with the Houston Oilers then the Philadelphia Eagles. During the next 35 years, he created five different restaurant concepts, including a breakfast concept, sports bar, and three different Chinese restaurants. Ready for another success, Lou set out to create something unique – not just another wing, burger, or pizza place. 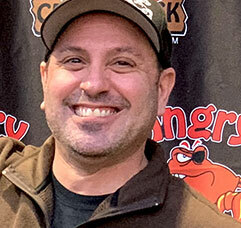 He launched Angry Crab Shack in 2013 in Mesa, AZ, which offers a vibrant, memorable dining environment and high-quality seafood at a more affordable price. The simplicity and bold flavors in Asian food attracted Lou. 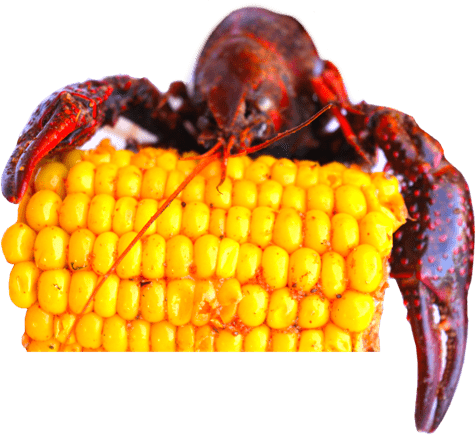 He was able to combine Asian- and Cajun-inspired seafood, affordable prices, and strategic real estate practices into the winning franchise combination we operate today. Seafood lovers from near and far have found their way to the Angry Crab Shack to experience the broad menu, outstanding service, and genuine hospitality. After repeatedly achieving remarkable sales growth and ROI, and then launching our first franchise-owned store at record-breaking sales revenue, we officially began franchising in 2018. Now, we’re looking to expand nationally and continue to grow our Angry Crab Shack franchise family. Lou has been an innovator in the restaurant industry for more than 30 years. He founded Angry Crab Shack in 2013, but it wasn’t his first venture in the restaurant industry. Lou owned the successful C-Fu Gourmet Restaurant in Chandler, AZ. 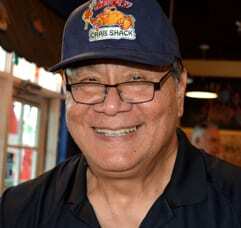 He has acted as President and Chief Executive Officer for Angry Crab Shack Corporation since the brand’s inception. He is also the owner-operator of multiple Angry Crab Shack corporate restaurants. In addition to his role as CFO, Diamond heads up franchise sales and leads the support and operations teams for Franchise Owners. He is also the owner-operator of multiple Angry Crab Shack corporate restaurants. Before joining Angry Crab Shack, Diamond was CFO of Cadillac Ranch. He shares Lou’s love for all things sports. WE GIVE YOU THE TOOLS TO MAKE YOUR RESTAURANT FRANCHISE RUN SWIMMINGLY. Angry Crab Shack Franchise Owners are part of the foundation of an exciting, emerging franchise brand. We cannot get to the top as a brand if you do not achieve your potential as a Franchise Owner. That’s why we put rock-solid support systems in place to help ensure your success in launching your franchise location. A combination of corporate-run and in-store training gives Franchise Owners the tools they need to launch their restaurant, including information about site selection, financing, Grand Openings, and more. Clear and effective training is the best way to set your staff up for success. Our experienced training and management staff support Franchise Owners and their employees to ensure franchise locations run as efficiently as corporate locations. We conduct training programs in-person and online. Franchise Owners receive in-depth management and profitability training conducted by our CEO and President. As our exceptional average sales volumes suggest, people love our Asian- and Cajun-inspired seafood. But, we know that building a loyal guest base requires a smart, multi-channel marketing strategy. We utilize traditional media as well as innovative digital media and social media to introduce Angry Crab Shack to your market and celebrate your Grand Opening. Our marketing team will help you create a robust digital footprint and assist you in using innovative digital and social media marketing methods that help you reach your target guest audience in your market. Our strategy is proven to bring guests to your restaurant and keep them coming back for more. Technology is key to a successful restaurant’s operations in today’s competitive market. 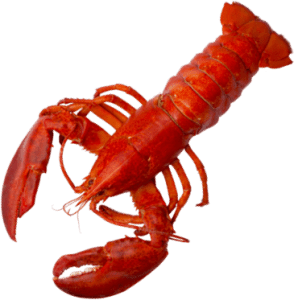 Angry Crab Shack has invested a significant amount of time and money into its technological offerings to ensure simplicity and effectiveness. Our company created a comprehensive package that covers the point of sales (POS), human resources, time and attendance, tip management, inventory, purchasing, quality control, checklist management, and state of the art PCI-compliant and EMV-certified payment processing. When choosing Angry Crab Shack restaurant locations, our company takes a different approach. We minimize the initial cost of entry and monthly overhead, which allows us to open new restaurants faster than normal. We focus our search efforts on second and third generation restaurant locations that usually include functional kitchens and bars, properly sized utility and HVAC systems, fire suppression systems, and proper zoning. This allows us to reduce build-out costs by limiting our renovation to décor and signage while utilizing the existing equipment and utilities. Lower build-out costs and reduced renovation time, combined with a $3,059,040 Average Net Sales*, make up Angry Crab Shack’s proven formula for success.